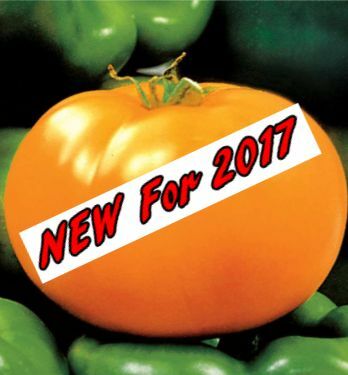 175 varieties of heirloom tomatoes are sold. 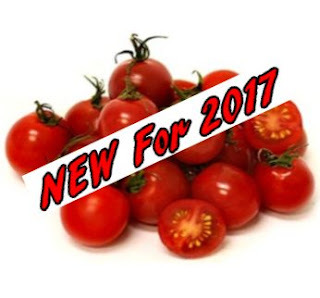 Here at Natures Choice Biodynamic-Farm last year we asked our clients what were their favorite tomatoes. The results are in! 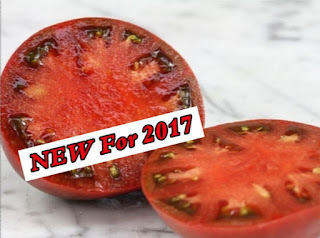 The best-tasting heirloom tomatoes last year were: Amana Gold, Belgium Giant, Big Aussie, Black Brandywine, Black Krim, Carbon, Carolina Gold, Cherokee Purple, Garden Peach Salad, German Johnson, Golden Jubilee, Green Zebra, Hawaiian Pineapple, Husky Red, Italian Beefsteak, Mortgage Lifter, Mr. Stripey, Oxheart, Ponderosa Pink, Red Brandywine, Red Delicious, Roma, Rutgers, Super San Marzano, White Wonder. Black Cherry, Grape, Husky Red, Indigo Blue Berries, Juliet, Large Red Cherry. Snow White Cherry, Sun Sugar Gold, Sweet 100, Yellow Pear. There are just so many excellent heirloom tomatoes available that it’s truly a tough task narrowing down all the choices! If you’ve had a hard time picking which ones to plant, take a look at this list of 31 delicious old-time heirloom tomatoes. You could pick these heirloom tomatoes for a variety of colors, tastes and forms, as well as for relative ease of growing and prolific qualities. Pick up some fruit or starter plants at our stand in the downtown Kansas City Missouri Farmers Market and get growing heirloom tomatoes, a bounty of the best tomatoes you’ve ever eaten from your garden! Also pick up some of our Peppers there. Many tomato cultivars have names indicative of their dark color, such as Black Krim, Black Brandywine, Carbon, Black Cherry, Indigo Blue Berries and Cherokee purple. These colours alows the chlorophyll not to efficiently degraded resulting in the accumulation of the pigment pheophytin in the fruit.This pigment combined with other carotenoids in the fruit, including beta-Carotene and lycopene, produces a brown or black color. Anthocyanin is responsible for fighting diseases like diabetes and obesity, and is the main pigment that lends the tomato its purple color. And when the purple tomatoes are mixed with the regular red ones, the resultant breed turns out black. These colors might not sound very appealing, but black tomatoes are supposed to be very tasty. Amana Gold 75-80 days. 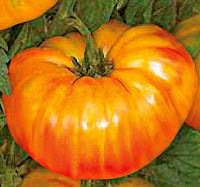 Big, 1 pound glowing-gold beefsteaks. 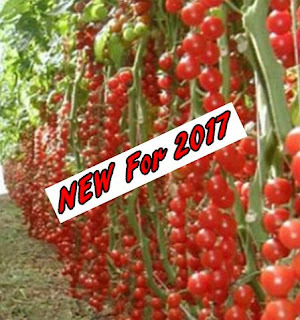 Exclusive to Nature's Choice, is a very attractive tomato full of intense flavor. A single slice of these very large late gold tomatoes, with flavorful low-acid meaty flesh, will cover a full piece of bread for your open faced tomato sandwich. This gold heirloom has tall vines that need staking. Indeterminate plant. This huge orange heirloom tomato takes its name from Iowa's Amana Colonies, one of America's longest-lived communal societies, where it has been a long-time favorite. Belgium Giant One of our most popular heirlooms. 85 days. 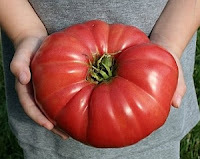 Plant produces good yields of huge 2 lb to 5 lb dark pink sweet and very mild beefsteak tomatoes. 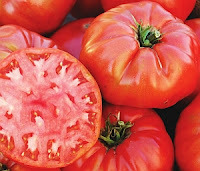 Tomatoes are very sweet, are meaty, and turn dark pink when mature. A low acidity tomato that is excellent for salads, sandwiches, and canning. Pink-skinned tomatoes occur as a result of a clear skin over red flesh. 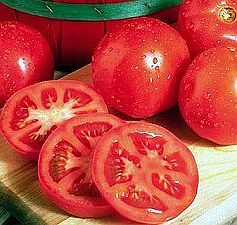 (Ordinary red tomatoes have yellow skin over red flesh.) When ripe fruits retain green pigment, tomatoes take on purple and brownish hues. So huge you only need one slice per sandwich. A heirloom variety from Ohio, USA. Indeterminate. Big Aussie This is one of those varieties to grow when you want a really big, impressive red tomato to show off to your friends. This fruit is huge, at least a pound or two, and borne abundantly on large, vigorous plants. Its flavor is as big as its size, bursting with a great blend of sugars and acids- a full old-fashioned tomato taste. Heirloom variety from Australia. Indeterminate. 85 days. 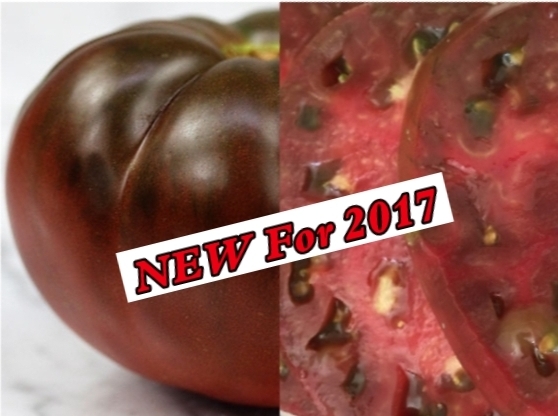 Black Brandywine heirloom tomatoes, are a high-yielding family heirloom, Black Brandywine may have originated in Pennsylvania. Fruits are dark red and round, and they have a rich flavor with a hint of sweetness. Tomatoes can be as large as a pound. Plants are indeterminate with heavy foliage, and fruit grows in clusters of 4-6. 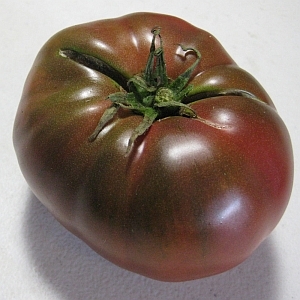 The Black Brandywine is one of the most popular heirloom tomatoes that ever existed. Because of its great flavor, Black Brandywine is possibly the most coveted. If you have never experienced what a true tomato should taste like, you MUST grow these. Words are not enough to describe this tomato, you’ll just have to experience it for yourself. Black Krim heirloom tomatoes. Part of the fun of growing heirlooms is impressing your friends with the unusual colors these old varieties are known for. So what could be more of a conversation piece than a black tomato? Here’s one of the tastiest of the oddly colored varieties, not actually black, but close to chocolate. Indeterminate. 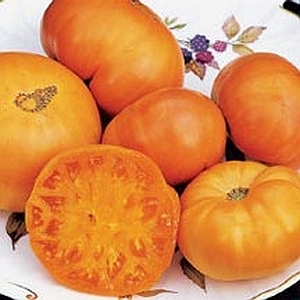 Slightly flattened 4-5 inch fruits with nearly black shoulders have strong, exotic flavor that’s been described as “smoky” or “salty.” Russian variety named for the Crimean peninsula in the Black Sea. 70-90 days from transplant. Care: Plant 24-36″ apart in rows 3-4′ apart in full sun. Plants grow 4-6′ tall; provide a cage or trellis. Carbon, 90 days. Winner of the 2005 "Heirloom Garden Show" best tasting tomato award. These have won taste awards coast to coast in the last few years, so we were proud to have a small supply of plants and fruit. The fruit are smooth, large, and beautiful, being one of the darkest and prettiest of the purple types we have seen. They seem to have an extra dose of the complex flavor that makes dark tomatoes famous. Carolina Gold Tomato 71 days. Extra-large, smooth very flavorful, golden-yellow fruit and fruits are low in acidity. They bring a sunny glow to salads and dishes. Firm, meaty flesh; sweet mild flavor! 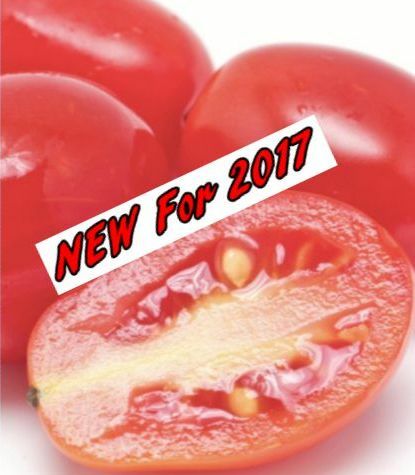 Testing indicates they may contain more readily absorbable lycopene than red tomatoes. The tomatoes ripen uniformly on vigorous, widely adaptable plants resistant to Verticillium and Fusarium Wilt. High yielding; does well throughout the country! Cherokee Purple heirloom tomatoes. 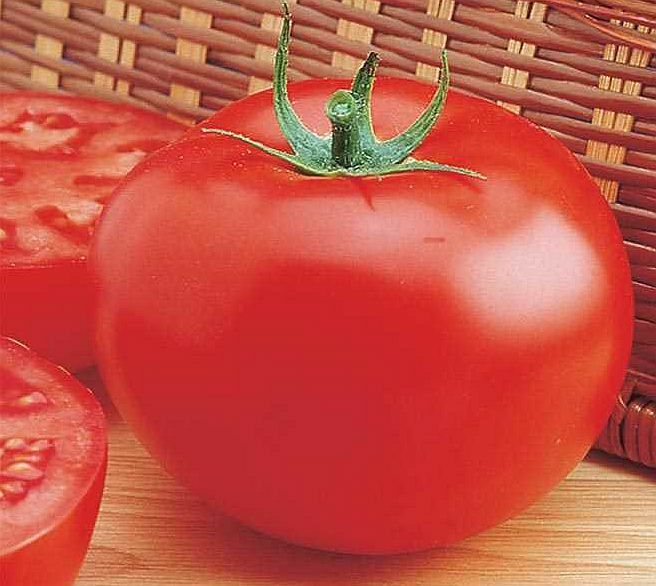 This tomato delivers wonderful taste, as well as the “wow” factor. 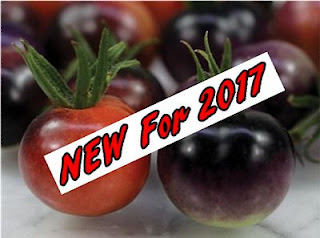 The pink to purple tomatoes are 6-12 ounces and grow in clusters of 2-4. Tomatoes have a rich, full-bodied taste that heirloom lovers say is like no other tomato. Cherokee Purple is indeterminate, with a moderate to high yield. A family heirloom, it’s believed to have been grown by the Cherokee Indians. Garden Peach Salad Tomato Produces prodigious amounts of velvety-skinned peachy-yellow fruits loaded with rich heirloom taste. A unique heirloom tomato, Garden Peach was reputedly introduced to US gardens in the 1860s. The small, velvety-skinned 2-3 oz. fruits have rich full flavor. The prolific vines unleash multitudinous 3-4" round fruits with peachy-yellow skin and flesh woven with hints of red throughout. Indeterminate. German Johnson, A parent line that gave rise to the illustrious Mortgage Lifter. Large lobed fruits with pinkish-red skin. Originally grown in West Virginia, this heirloom was one of the parent lines for another cherished heirloom: the legendary Mortgage Lifter. With pinkish-red skin and nearly seedless meaty, mild flesh, the large, lobed fruits weigh 3/4-1 1/2 lb. A favorite variety for slicing or canning. The disease-resistant, indeterminate vines thrive in hot, humid areas. 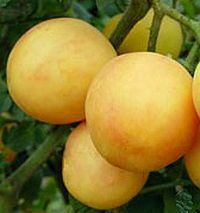 Golden Jubilee tomato is an old heirloom that was an All-America Selections winner in 1943 and is still one of the favorite yellow varieties being grown in gardens today. Having low acid and exceptional flavor, and said to peel like it has been blanched, this variety makes an outstanding juicing tomato, canning tomato and salsa tomato; yummy goodness all season long from this indeterminate plant! 70 days to harvest. Green Zebra has a characteristic dark green and yellow stripes. High-yielding indeterminate plants produce oodles of 1 1/2-2 1/2" fruits. 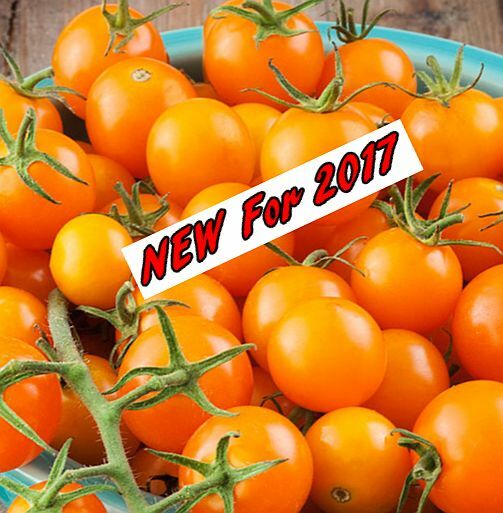 It is more tart (described as 'spicy' and 'zingy') than regular tomatoes, and it is an early cultivar. Compared to other tomato varieties, it can produce somewhat mealy fruits depending on growing conditions. 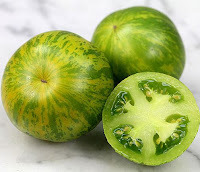 A green tomato meant was thought not to be ripe and they were normally thrown out. However, this intriguing tomato is ready to eat. There is some controversy as to whether Green Zebra should be considered an heirloom tomato. Some people don't consider it an heirloom quite yet, while others consider it either an heirloom, "modern heirloom" or "created heirloom”. 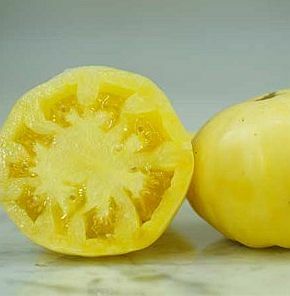 Hawaiian Pineapple Tomato Named for its shape, not flavor, the indeterminate Pineapple tomato is a bi-color beefsteak tomato. Its outer ribbing is reminiscent of a pineapple’s ribbed exterior. The tomato’s size, too, places it in the category of large tomatoes. Pineapple is a very pretty fruit, with a beautiful streaked red and yellow exterior and interior kaleidoscope swirl of red, pink, orange, and yellow. It is a colorful addition to salads and sandwiches. Range from one pound to often more than two pounds in size. 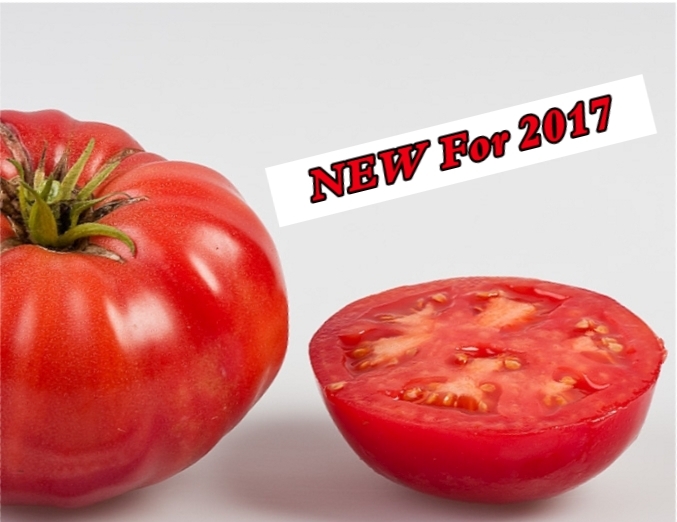 Italian Giant Beefsteak A richly flavored Italian heirloom that produces giant-sized, deep red tomatoes sure to please the whole family. One slice covers the whole plate, or chop them up for fresh salsa and sauces. Tall, vigorous vines need staking. Indeterminate. This blockbuster of a beefsteak was brought over from Italy over 80 years ago, and still rules the garden for sheer size, with some fruits growing larger than two fists! A deep red beefsteak-type, with flattened fruits averaging 16 oz. and 4" in diameter - meaty and delicious, yield after impressive yield. Excellent for salads, sandwiches, and Italian dishes. Mortgage Lifter 85 days. Large, smooth, 1-lb. pink fruit have a delicious, rich, sweet taste. This variety has become very popular in recent years, after being developed by M.C. Byles of Logan, West Virginia. 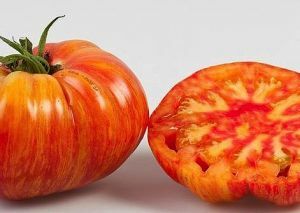 Mr. Stripey (sometimes confused with Tigerella) is a type of heirloom tomato with unusually small leaves and a mix of a yellow and red color that can fool some growers into thinking they are picking an unripe tomato. 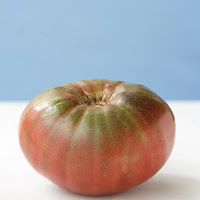 In size, shape and internal structure it may be considered a "beefsteak" .Like other heirlooms, Mr. Stripey has an appearance that differs considerably from other tomatoes. In coloration it is more yellow near the stem and more red towards its underside, with stripes of red and yellow blending along the sides. Mr. Stripey's mild, sweet-tasting fruits have a high sugar content and grow to over 1 lb. each. 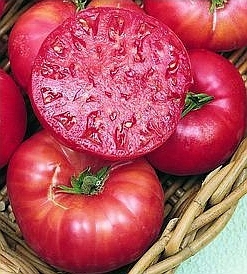 Pretty and luscious, this tomato has rich yellow undertones covered with pinkish-red striping. Indeterminate. 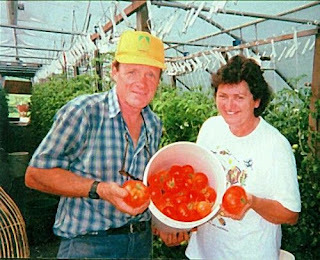 Oxheart Tomato plants produce big (10 to 16 ounce fruit), beautiful, heart-shaped tomatoes known mostly to old-time gardeners. Tomatoes are simply beautiful with their pointed shape, but it is the intense tomato flavor that really makes this one special. Both meaty and juicy with few seeds, its sweet, rich flavors erupt from its deep pink flesh. Ponderosa Pink, 88 days, indeterminate — 'Ponderosa' is an old classic and a good producer. The fruits are large, weighing twelve ounces to two pounds, have small seed cavities, and borne in clusters of three to five fruits. They are purplish-pink in color, mild flavored, and excellent for slicing and canning. They do have fair to poor leaf coverage, require staking, and under certain conditions, can be prone to cracking. Red Brandywine heirloom tomatoes, are a high-yielding family heirloom, Red Brandywine may have originated in Pennsylvania. Fruits are bright red and round, and they have a rich flavor with a hint of sweetness. 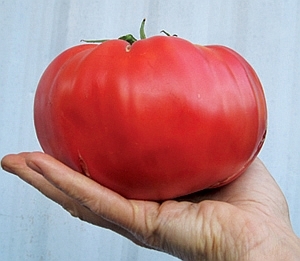 Tomatoes can be as large as a pound. Plants are indeterminate with heavy foliage, and fruit grows in clusters of 4-6. 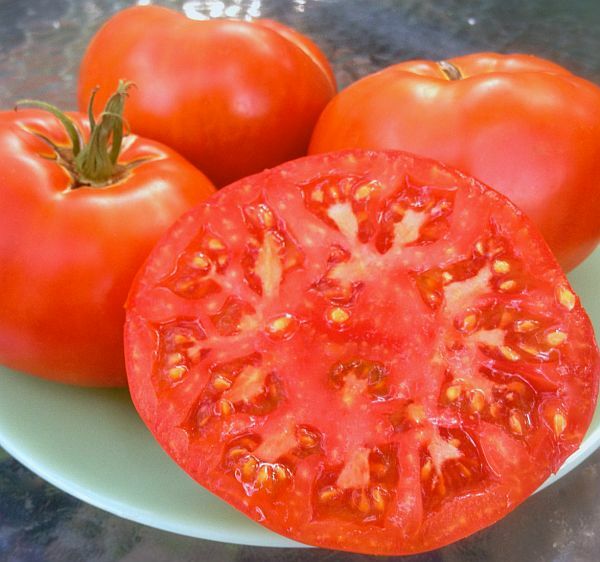 The Red Brandywine is one of the most popular heirloom tomatoes that ever existed. Because of its great flavor, Red Brandywine is possibly the most coveted. If you have never experienced what a true tomato should taste like, you MUST grow these. Words are not enough to describe this tomato, you’ll just have to experience it for yourself. Red Delicious Huge, solid scarlet fruits average 1 lb. ; some even weigh 2 lb. Smooth, crack-free, excellent slicer with extra delicious flavor. The tomato that holds the record at 7 lbs.! Even if yours don't beat the record, your crop will be plump, meaty fruits that weigh well over a pound. The name describes the taste—flavorful, juicy and just plain delicious. Fruit resists cracking and stores for weeks. Indeterminate plants produce huge yields. 77 days to maturity. 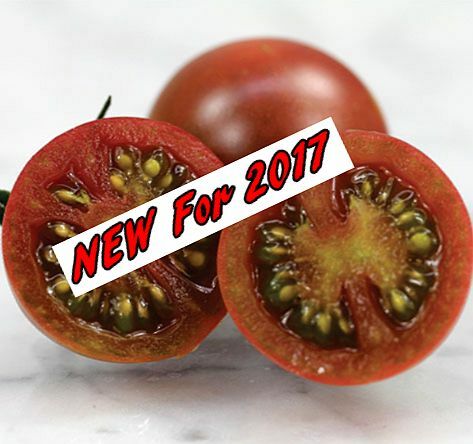 Husky Red Tomato is a delicious, disease-resistant variety with a controlled growing habit that makes it perfect for containers and small growing spaces. The high-yielding plant may require moderate staking in containers. Look for a no-nonsense yield of 7 oz, medium-size red Tomatoes for sandwiches, salads, and fresh eating about 67–70 days from transplant. Requiring no pruning, the dwarf, indeterminate vines will grow to about 4'. Plants are resistant to Verticillium Wilt, Fusarium Wilt, Alternaria Stem Canker, and Gray Leaf Spot. 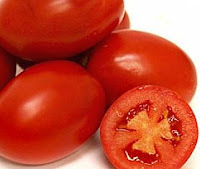 Roma is a plum tomato popularly used both for canning and producing tomato paste because of their slender and firm nature. Commonly found in supermarkets in some countries, Roma tomatoes are also known as Italian tomatoes or Italian plum tomatoes.The "Roma VF" variant is most common in seed catalogs as of 2007. Most commercial plum tomatoes sold in markets in the Western Hemisphere are Romas or related types. Smaller plum tomatoes about the size of cherry tomatoes are sometimes sold as "baby Romas". 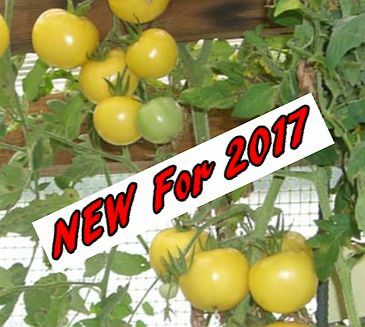 A smaller relative known as "Windowbox Roma" is sold as a tomato suitable for window gardens and hanging containers. Rutgers An old favorite, Rutgers is proven to be highly productive. The large, red fruits have a thick flesh with superior flavor. Strong determinate vines yield a large initial crop followed by several flushes of fruit. This is one of those classic tomatoes that has been used as a parent in the breeding of many other hybrids. Seldom has problems with cracking. Resistant to verticillium wilt (V), fusarium wilt (F), and alternaria stem canker (A).The justly famous Rutgers tomato was introduced in 1934 by Rutgers breeder Lyman Schermerhorn as an ideal locally well-adapted and improved "General Use" tomato for processing (canning and juicing) as well as fresh market. Rutgers tomato was developed and released in the period between WW I and WW II. 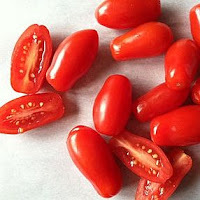 Super San Marzano is a variety of plum tomato, considered by many chefs to be the best of its kind in the world.Compared to the Roma tomato, San Marzano tomatoes are thinner and more pointed. The flesh is much thicker with fewer seeds, and the taste is stronger, sweeter and less acidic. Many people[who?] describe the taste as bittersweet. The San Marzano vines are indeterminate and have a somewhat longer season than other paste tomato varieties, making them particularly suitable for warmer climates. 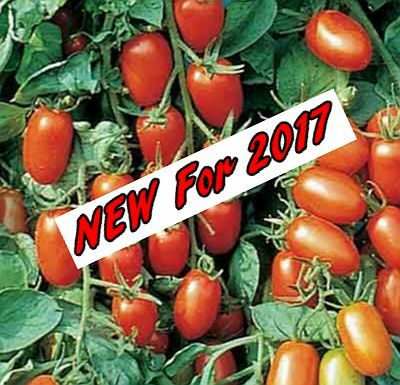 As is typical of heirloom plants, San Marzano is an open-pollinated variety that breeds true from generation to generation, making seed saving practical for the home gardener or farmer. 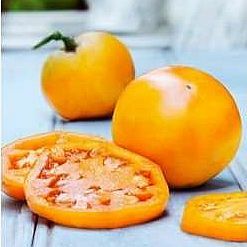 White Wonder Beefsteak tomatoes have yellowish-white flesh when mature and make a nice color contrast when served with red and orange varieties.Maintains good texture and flavor even when large. Mild and sweet with high sugar content. Great for fresh eating and canning! Average time to maturity is 90 days. Fruit that is fully ripened on the vine has a much fuller flavor than fruits that are picked early and then allowed to ripen. This ivory-white beefsteak is an easy one to grow, and it produces medium-size fruits with super-sweet flavor and low acid. A delicious, knockout addition to your sliced tomato platters and sandwiches. Surprise your friends with white cream of tomato soup, or white tomato sauce on spinach pasta. Black Cherry This truly black cherry tomato was bred in Florida by the late Vince Sapp. Pick loads of these perfectly round, dark fruits with rich, sweet, dynamic flavor from just one plant. Great for shish-kebabs, salads (they’re striking! ), or just eating in the garden. Vines are quite vigorous, so use a tall cage. Open-pollinated. Grape A grape tomato is a class of tomatoes believed to be of southeast Asian origin, shaped similarly to the oval plum tomatoes but having the small size and sweetness of cherry tomatoes. Grape tomatoes produce small and typically oblong fruits. Introduced to the worldwide market in the 1990s, they have gained substantial popularity, due at least in part to their higher sugar content compared to regular tomatoes, and due to their smaller, bite-sized shape. Indigo Blue Berries 75 days. Here’s a small cherry variety from Brad Gates of Wild Boar Farms. Very dark purple color, which means it’s super-rich in anthocyanins. Unripe, the fruits are a glowing amethyst purple. At maturity they turn deep red where the fruit was shaded; the areas that received intense sunshine are a purple so deep it’s almost black! The flavor is intensely fruity, and sugar-sweet! Plants are very productive, yielding all season in elongated clusters that look so beautiful. Juliet Slightly larger than the well-known Santa grape tomato, Juliet bears delicious, sweet fruit on indeterminate vines. Some gardeners refer to it as a mini Roma because of the shape. The wonderfully sweet fruit are crack resistant and remain in good condition on the vine longer than most cherry tomatoes. The fruit are as soft and juicy as cherry tomatoes, they hold up well in salads, even leftovers, and they have a longer shelf life so you can keep them on hand without picking every day. The vigorous vines set lots of fruit on long trusses and keep setting fruit throughout the summer. Quite heat tolerant. Vines are long and vigorous, so give the plant room to tumble over its cage. Tolerant to late blight. Resistant to early blight. One of the longest-lasting tomatoes in the garden. Large Red Cherry Just like the name says, prolific large red cherry tomato, 1-1/2” plus fruit. Originally a very old type, tried and true. Great full flavor. Preferred variety for canning whole. A favorite for salads and fresh eating Tags: Type: Indeterminate, Harvest: Mid, Color: Red, Size: Cherry, Shape: Round, Specialty: Canner, Heritage: Heirloom, Season: Summer, Certification: Organic. Snow White Cherry Chances are you won’t being seeing this rare, exquisite variety of white cherry at your local farm stand. Both uncommon and uncommonly scrumptious, ‘Snow White’ is loaded with sweet fruity flavor (with a welcome note of pineapple) and fragrance. Compact indeterminate plants produce an outsize yield of delectable 1-2 oz. fruits. Sun Sugar Gold This treat of a tomato is one of the garden’s sweetest. Children will eat them like candy. Sun Gold ripens in long clusters of 10 to 15 fruits. The sweet flavor is ready about a week before full coloring. Wait to pick fruits at their deepest hue and you’ll experience a richly sweet, fruity flavor. Eat fruits as a healthy snack, add to green salads, or mix into fruit salad. Plants bear fruit well into fall and also make a great fall-planted crop in warm regions. If space is tight, try Sun Gold in containers–at least 24 inches in diameter to fit the big plant. You won’t be disappointed. Plants definitely need staking or tall cages; gardeners report this tomato to grow as tall as 10 feet. The indeterminate vines are resistant to many diseases. Sweet 100 When Sweet 100 tomato was first introduced it created a buzz among gardeners because it is so tasty and produces for such a long time. Its long, branched clusters of deliciously sweet tomatoes high in sugar and vitamin C. But Sweet 100 is known to be disease resistant, giving plants in a better chance where certain problems may be soil-borne. You’ll be eating them right off the vine before they ever make it to the salad bowl! They are perfect for snacking, salads, and even juice. Sweet 100 lives up to its name, especially when harvested that the peak of ripeness. The indeterminate vines continue bearing until frost. Give them a tall support because they grow and grow over the top of the cage and back down again. 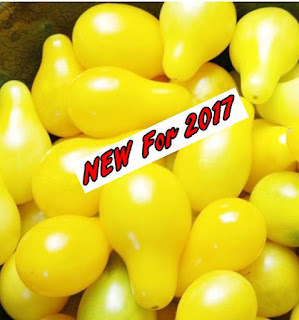 Yellow Pear Named for its color and shape, this beautiful, bite-sized heirloom is prized for snacking, salads, and as a complement to any dish. Heirloom. Long, indeterminate vines produce a seemingly endless supply of mild flavored, pear-shaped tomatoes all summer. The tiny tomatoes are borne in clusters. This is one of the prettiest tomatoes in the garden — it’s beautiful in salads! This variety is known to bear fruit dependably through summer weather. Vines can grow 8 feet or longer, so give them a tall support or place to ramble. And there you have it – 31 tasty heirlooms to try this season. Your garden can be filled with old-time goodness, and I guarantee your taste buds will thank you! Heirloom Tomato City Market Kansas City Copyright 2015. Simple theme. Theme images by Ric Old. Powered by Blogger.